GDP per capita measures the overall economic output of all economic activities in a region (measured in terms of purchasing power standards). This indicator is probably the most widely used indicator to measure economic development and prosperity of regions and urban agglomerations. Urban areas or cities are often drivers of economic growth and development. However, it is difficult to acquire economic growth data, such as GDP or GRP, at an urban level. There is no simple indicator of economic growth that is tailored specifically to urban areas and equivalent to GDP. Despite the shortcomings, GDP per capita at current market prices (based on place of residence) was used as measurement of an economic performance of the cities in Urban Audit. NUTS 3 regions were utilized as proxies for city GDP. As for the regional dimension, some general fpatterns characterize the analysis at the BSR level. It is the east-west divide and core-periphery divides (large and small cities) which is evident also when studying the economy from an urban perspective. Highlighted also in the regional analysis, it is clear that the urban areas stand out as relative prosperous in all countries. 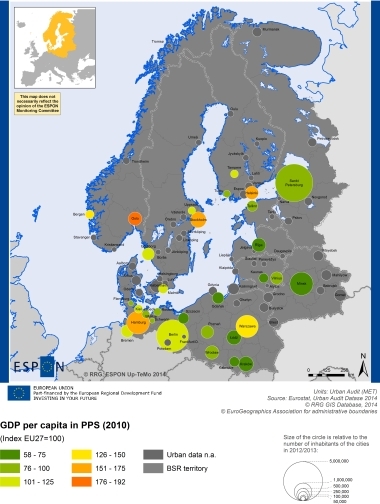 However, in the most eastern cities, namely Minsk and St. Petersburg, and in Polish cities, the level of urban GDP is far below that of western cities. Unfortunately the data available at the urban level does not allow for an analysis of the dynamics of urban GDP. We know, from the regional analysis that the change of GDP per capita reflects impacts of financial and economic crisis. However, it is probable that some urban regions have been more resilient to such downturns as they are the drivers of much of the economic growth and are less vulnerable to sector-specific downturns.